Every maker has a story. Be a part of Look Studio's story by placing an order, leaving a review, and seeing your review appear here. Abstract Art customized for each client. Playful and reminiscent of the beaches in Mexico, La Playa has a story to tell. 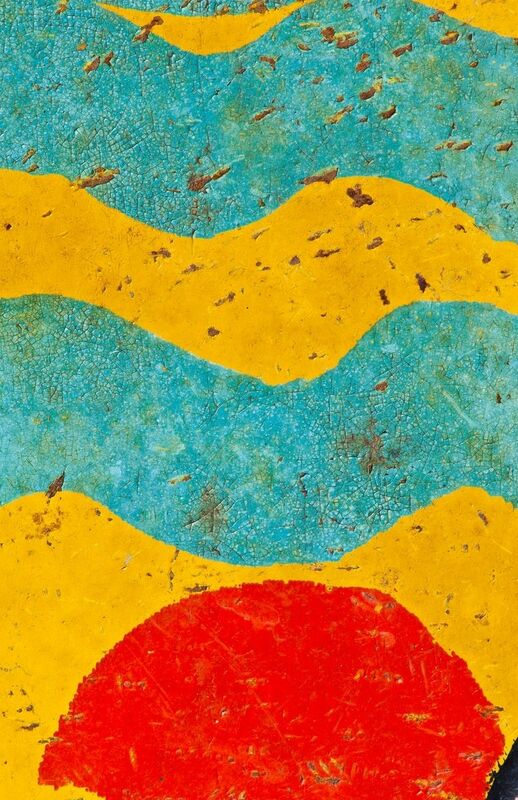 This abstract macro photograph evokes thoughts of sunshine, water, sand and warmth using bright red, yellow and turquoise. Crackled paint adds depth and movement to the blue waves evoking thoughts of sparkling water on tropical seas. La Playa is fun in the sun and is priced as a 24"w x 36"h canvas gallery wrap with a black float frame 2" deep. All photographs are limited editions and are available in other sizes, print media and framing options. Materials: Through digital technology Gayle's art uses a variety of materials from bamboo paper, canvas, polyester, linen material to metallic paper, customized for the specific project. Intended use: Gayle's abstract photography creates a colorful splash of art in homes and in commercial projects, from wall decor to a kitchen backsplash, a room divider or window cover, this digital perspective has a variety of applications. Style: Modern, contemporary with bold colors and shapes and textures.